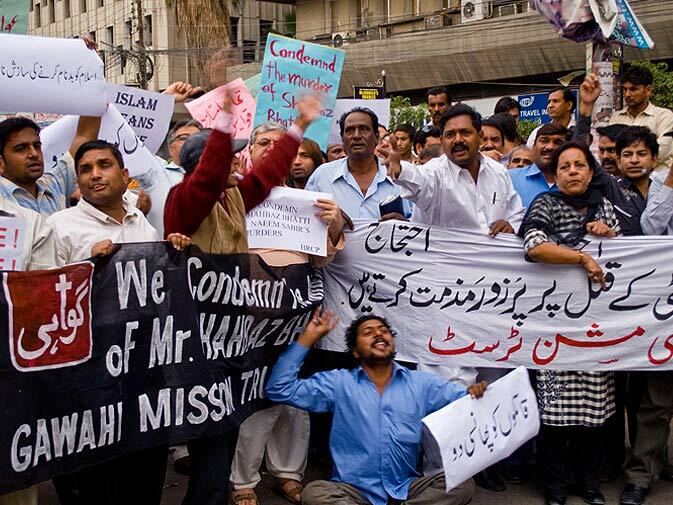 Another top official gunned down today in Pakistan for his support to reform the Blasphemy law. Shahbaz Bhatti was the federal minister for minority affairs. The only Christian in the Cabinet. Science breathes in open societies. It thrives in regions that allow multiple voices to be heard. There are exceptions - but over all, the pattern is there. The pre-Socratics encountered a variety of sea-farers docking on the ports and islands off the Aegean coast. Samos. Miletus. Ephesus. The Abassids brought the world to their courts in Baghdad. The translation movement brought scholars from the world over. Christians. Jews. Nestorians. If there was no Hunayn Ibn Ishaq - there would be no Ibn Sina. Then we have Pakistan in the 21st century (at least temporally it is the 21st century). Pakistan is setting up an example of counter-culture. At a time when numerous Arab countries are standing up to demand their individual rights and a democratic system, Pakistan is seeing rallies for the defense of an assassin. Whereas Egypt saw Muslims come together to defend their Coptic citizens, Pakistan is spiraling into an abyss of intolerance. Salman Taseer was killed in January - because he had proposed reforms to the much abused Blasphemy Law and had stood up for Aasia Bibi - a Christian mother of four - who has been sentenced to death under the law. Shahbaz Bhatti also supported the cause and was killed today. And then we have Sherry Rehman - the brave former minister and one of last voices in the government still advocating reform. She has received death threats and has been living under heavy protection. The only religious scholar to speak up against the blasphemy law and the assassination was Javed Ahmad Ghamidi. He left the country last year, after threats to his life and family. I disagree with him about evolution, but I'm so glad he is speaking out. There is definite uncertainty in the Middle East at the fast-turning events. Libya has turned bloody. But there is also hope in the relatively peaceful and secular uprisings of Tunisia and Egypt. The Egyptian cabinet is already seeking focus on science and education. How can science be a focus in Pakistan - when officials are being gunned down because of their views and, some times, their religious background? Science values difference of opinions. It thrives in environments where people can speak their minds and can think freely. There are no ideal places - but some places are better than others. It pains me to say that, but Pakistan of today is not such a place. In fact, Pakistan has the world's largest out-of-school population, but it spends 7 times more on arms than on primary schools. This is not an indictment of the whole Pakistan - which I'm sure is going to be interpreted in the comments. Sherry Rehman is also a Pakistani. So are some of the bravest women I know of: Human rights activists, Asma Jahangir, Hina Jilani (Asma's sister), and Mukhtaran Bibi. There were also brave people protesting today's killings - a few hundred people showed up. But there has to be a visceral reaction against religious intolerance. No ifs or buts, or the reliance in the mythic 'silent majority'. People have to speak up against religious intolerance. That is, if they are indeed against religious intolerance. The rallies in favor of Mumtaz Qadri - the assassin of Salman Taseer - makes me wonder about the views of the 'silent majority'. So science? Yes. First speak up against religious intolerance! Please also see Nidhal's post on Monday, that recounted the treatment of Usman Hasan in a Muslim community in UK for speaking out in favor of biological evolution. Very sad...a show of no respect to human life by people whose human life is as worthless to the 'civilised' world in the first place too. Really sad. These sublime Catholic martyrs are specifically instructed NOT to preach in Algeria, Somalia and other places where they have been murdered. There only witness is the beauty of their souls as revealed in their loving actions as nurses and such. 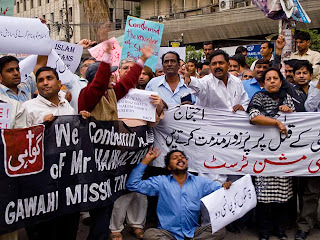 In Pakistan, for instance, evangelicals secretly convert Muslims but the Catholic church carefully follows the Islamic Sharia law and tries to ‘cooperate’ with them to be allowed to ‘exist’, distancing themselves from non-Catholics who tell Muslims the truth. Over one and a half billion Muslims consciously kept in ignorance of the message of Jesus Christ by the collusion of the Catholic Church with ‘Islamic Sensitivities’. This incidence is truly appalling beyond doubt, but here I would beg to differ on a few points you have raised. You seem to be driven away by emotions and I can understand, but being a scientist, I do expect from you not to depart from reason and sane judgement. Where is the objectivity dear? You seem to confuse three things here...crime, society, and science. A person was murder by a group of armed criminals...Mara Salvatrucha style which is only one of the 30,000 gangs in the USA and nearly a million gansters. Yet who portrays the entire american nation as criminals? At least I don't. That does not reflect the picture of the entire society. So why Pakistani society is always at the receiving end for anything that goes wrong here just like anywhere else? Simple answer...intolerance and hatred for Pakistan and Pakistanis, the very thing you are preaching against. So double check what you say. Yes intolerance is a serious problem here, but I would never let you get away with what you always say about Pakistani society per se. So much of your petitio principii, you always bring this nuisance in whatever not even distant in relevance. Now the question about science in jeopardy. Yes there is negligible science scene in Pakistan. But how is it related to intolerance? The country in middle east harboring the world's largest ghetto is also the forebearer of science and technology and we owe a lot of scientific progress to them. Science was not in jeopardy in the country where a woman is killed and her husband shot inside the courtroom under the very nose of the law. I mean where is the relevance to intolerance and science here I don't understand at all. And yes, amateur astronomy (I am a Pakistani astronomer, so that is a quickest example I could grab) is flourishing phenomenally in Pakistan in a way totally unmatched in the entire region in South Asia. I am talking about AMATEUR astronomy as it is a reflection of society, in contrast to the PROFESSIONAL astronomy which is a state affair and is in sorry state of affair in Pakistan I agree. So to conclude, one does not need to suffer sleepless nights across the Atlantic for our science, as we are here to take care of it at whatever level we can. And oh! you mentioned Asma Jahangir. From pseudo-analyst Dr. Hoodbhoy, to pseudo-journalist Najam Sethi, down to the pseudo-activist Asma Jahangir, you seem to have a perverted sense of affection for the notorious lot. She may be Brave in your opininon, but I have a different 'B' word for her. Salman, what is happening in Pakistan is beyond belief,that such intolerance exists in the 21st century. I have a feeling, though, that this might be the last hurrah of the mullahs and the bigots. They probably feel that their time is up and are desperately fighting their last battles. They know that human progress is not on their side. I just hope they don't cause too much suffering before they go. There is a wide gap between liberal and extremist mindset. The problem is the balance of power. But blaming the entire society is itself an extremist mindset and an utter show of obsessive hatred and intolerance for Pakistan. And Dr. Salman, is this a science blog or an instrument of spewing hatred for the Pakistani society. Decide it for yourself. "I have a feeling, though, that this might be the last hurrah of the mullahs and the bigots. They probably feel that their time is up and are desperately fighting their last battles. They know that human progress is not on their side." Mohamed: Hope you are right. Though the arrow of the past few years in not very encouraging. But then things can change quickly - as we have seen in Egypt - and what we saw in the Lawyer's Movement in Pakistan in 2007. We also saw a glimmer of a vast reaction against intolerance when the Taliban took over Swat couple of years ago. But the systematic assault on minorities in the name of religion is providing fodder to the religious parties - and it is this particular aspect that seems dangerous and for the time being, harder to contain. Agreed with you. I hope you are not judgmental in extremis about Pakistani society in general. The more violent these beasts would become, the more they will lose public support if any. It is just the balance of power on the wrong side which once exhausted, their dirty game would end. 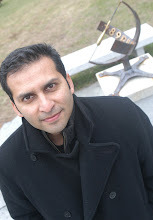 Dr. Hussain. I hope I didn't sound judgmental on the whole of Pakistani society. I have no reason to do that, and in fact I admire Pakistan for many things and I have many wonderful Pakistani friends. It's just sad how so many people seem to be in thrall to the mullahs over there these days. Salman: I agree that things look very dangerous, and I hope the moderate people find the courage to stop this downward spiral. It's frustrating that we can't do much to help from the outside. BTW, the piece by George Fulton was very touching. Glad you put posted it. You are not judgmental indeed, but the extremist and intolerant mindset against Pakistani society definitely is, where eloquence of subjectivity driven by emotions and hatred takes over objectivity and reason and later on disguised as enlightment. Extremism is taking roots in Pakistan no doubt, but having this opportunity to defame and disgrace the society in general is an intentional attempt to harm our interests from outside. It is as vicious as the way the extremists are eroding the fabric of this society from inside. I, as a Pakistani, have a duty to defend both evils. So no matter whether it be an extremist mullah of a religious outfit or a pseudo-analyst or pseudo-activist, interest of Pakistan is paramount for me and I have a responsibility here. It is the responsibility of our public to understand the mission and agenda of these terrorists. Christians are also Pakistanis; this thing must be realized and respected by all of us. It is included in a Muslim’s faith that he should accept previous three holy books and all prophets including Jesus (A.s). So please understand that Christians are our brothers, indeed the person having any religion but accepting the one God and obtaining good moral values is real Muslim in Sufism thoughts. Muslims, Christians, Jews, Hindus, Sikhs, Buddhists and all others are generation of one Adam & Eve. Not any prophet in the world ever tried to spread his separate religion from other prophet, the message of every prophet was the same and the religion was also the same. It is human’s fault that we are divided into religions on wrong basis.